Several months back I was asked by the editor if I might be able to include a review of a cruising catamaran in an upcoming issue of SpinSheet. Well, truth be known, my multihull sailing experience consists of several outings on friends’ Hobie Cats where I always felt just a bit out of control. My only multihull design project was a simple trampoline-styled catamaran to fulfill minimum curriculum requirements as a student, years ago. And I have surveyed only one multihull in the last year. I admit to being just a little nervous about this assignment, but I accepted figuring the research required would only broaden my knowledge, and if you’ve looked around the boat shows over the last few years, it’s apparent multihull sailing is gaining in popularity. The selection of a boat to review was left up to me, but, to coin a popular expression of our times, it was a no-brainer. The Gemini, with well over 400 boats built, is, by far, the most popular cruising catamaran in the United States, and the designer/builder, Tony Smith of Performance Cruising, Inc., is located right here in our back yard. For years, Performance Cruising operated at Casa Rio Marina in Mayo. Recently they moved to a beautiful new facility on Edgewood Rd. in Annapolis. Introduced in 1981 the original Gemini 31 was patterned after the Aristocat designed in 1969 by Ken Shaw. Over the years there were several incarnations of the original design including the Gemini 3000 and the Gemini 3200. Although there were minor changes in LOA and styling, all were based on the original hull shape and design. It’s difficult to distinguish, at a glance, a 1982 from a 1992 model. In 1996 Tony Smith totally redesigned the hull and introduced the current Gemini 105M. Construction of the Gemini is quite conventional with a solid lay-up of fiberglass mat, woven roving and polyester resin used for the hull. The decks are cored with end grain balsa for stiffness. Beginning with the Gemini 3200, a layer of vinylester resin was incorporated in the lay-up schedule of the hull in order to help prevent osmotic blistering. According to a survey conducted by Practical Sailor several years ago, about 20% of the owners of older Geminis reported some degree of osmotic blistering. This is likely below the average for 1980s vintage production sailboats. There are polyurethane-coated plywood centerboards in each hull which fully retract providing for a scant 18" of draft with the boards up and 4’ 9" with the boards down. Many of the bulkheads of the Gemini are not tabbed into the structure but are free floating. This is by design similar to aircraft construction, and the structures have reportedly held up well. There have been some reports of water migrating into flotation chambers of some Gemini models and going undetected due to the lack of inspection ports. In addition, drains in the port side sail locker are sometimes below water when under sail resulting in the locker partially filling with water. Window leaks are another persistent problem on older boats. The most attractive feature of a catamaran for the cruising sailor is livability. When it comes to livable accommodations, the Gemini is difficult if not impossible to beat. On what other 30’ boat could you and your mate enjoy a private cabin with a comfortable queen sized bunk, invite two other couples along for a weekend and offer each their own "intimate" double cabin, have a head large enough to shower comfortably in and still have room for a dinette large enough for all to squeeze into for dinner? The Gemini offers this plus a good size galley and cockpit large enough to accommodate all your guests without feeling crowded. If accommodations are the number one attraction of cruising catamarans, then speed and performance must be number two. Some will argue the relative importance of these two. The simple fact is, on most points of sail, a well-designed catamaran is faster than a comparably sized monohull, and they don’t heel as much. A major key to performance of any boat is weight and weight distribution. However, catamarans tend to be less tolerant of added weight. Because the bridge between the two hulls of the Gemini is quite low, it tends to pound in short steep seas, particularly if the boat is overloaded. Nonetheless, Gemini owners overwhelmingly report satisfactory performance under most conditions. Older Geminis are powered by outboard engines, usually around 40 horsepower. An extra long 25" shaft is essential to proper performance and may be tough to find in the horsepower range if repowering becomes necessary. The major drawback of outboard power for cruising sailors and liveaboards is the engine’s inability to generate sufficient amperage to run power-hungry refrigeration units, and engine cooling systems can’t be used to heat potable water. Gemini’s solution is LPG appliances which, although efficient, can be quite hazardous when not properly installed, vented, or maintained. The beam of the Gemini has always been kept at 14’ which makes it possible to fit in a good sized slip at a modern marina as well as haul and launch the boat with lift equipment at most marinas. Due to its high freeboard and shallow draft the Gemini can be a bit of a bear to handle in tight spaces. Practice, patience, and planning are the keys to success. 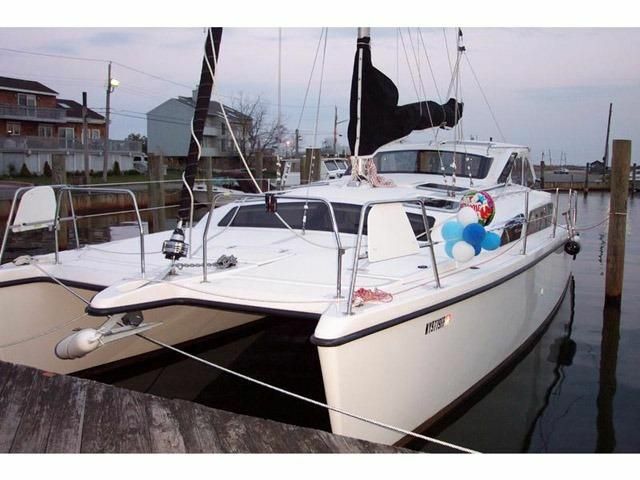 The Gemini is a moderately priced modestly constructed catamaran. Used Geminis generally offer excellent value, outstanding accommodations, and solid sailing performance. There is an active and supportive owners’ association and a local builder who is more than willing to support his product.